A 34-year-old man claiming to be the adopted son of actor Tim Allen is currently in police custody after allegedly stealing the star’s custom 1996 Chevy Impala SS. The alleged thief Faustino Ibarra, reportedly took the vehicle from Allen’s Los Angeles garage, and drove it all the way to Denver. As if that weren’t strange enough, Ibarra told police that Allen, his supposed adopted father, left the keys in the car for him so he could take a trip to Northeast Denver. There’s one glaring problem with Ibarra’s story, however: no one believer him. Not only do Denver police claim that Ibarra is lying, but FOX 31, who interviewed the alleged thief in jail, has also found no independent evidence that Allen ever adopted Ibarra. Sound a little crazy? Well, Ibarra doesn’t seem to mind. “I don’t care how it sounds, I know who I am. He knows who I am. He knows who he is,” Ibarra said. Los Angeles County is expected to extradite Ibarra so he can face charges in California, where the vehicle was stolen. Aside from motor vehicle theft, Ibarra may also face stalking charges, according to police. While a 1996 Chevy Impala may not sound like a highly desirable vehicle, Allen’s ride is about as custom as it gets. 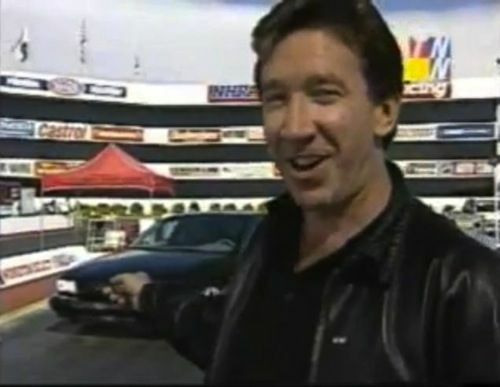 In 1996, the then Home Improvement star worked with Chevrolet’s Jon Moss and Wheel to Wheel’s Jeff Beitzel to convert a standard 1996 Impala SS into a one-of-a-kind vehicle. Containing both interior and exterior modifications, Allen’s Impala SS touts a DOHC 32-valve Corvette ZR1 engine and delivers 446 hp. Not to mention, the vehicle’s rear also boasts a “Binford 6100” badge, the fictitious tool manufacturer from Home Improvement’s “Tool Time” show. Allen even drove the special Impala SS to the People's Choice Awards and mentioned the vehicle on stage while accepting his award for Favorite Male Television Performer. “I got my two customized Impala’s out there instead of a limousine. I’m a hot guy,” boasted Allen. Allen’s publicist Marleah Leslie has declined to comment on the case because it’s a police matter. Stay tuned for more details as the story continues to unfold.